You are here: Home > News > Unenforced Neglect Threatens Holywood Listed Building. UAHS is disappointed to hear of yesterday’s collapse of one section of 1 Stewart’s Place Holywood. A prominent listed building dating from the 1850s, located in a prominent position at the head of Holywood Conservation area. 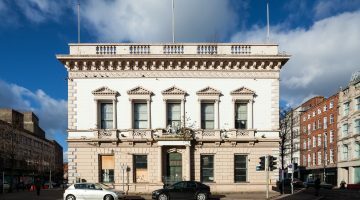 It is B2 listed, in recognition of its architectural and historical significance, being one of a pair of fine stucco buildings with curved corners matching its neighbour and arranged in an opposite gateway format. Previously in good condition, it has continued to deteriorate in recent years through simple neglect and lack of maintenance. It was placed on the Buildings at Risk Register in 2004. The building has been in present ownership for nine years. During this time there have been notices served by the DoE for its repair, but, as far as we are aware, there have been none since North Down and Ards Borough Council took over responsibility for enforcement in April 2015. The actual effect of notices served previously is questionable when the current poor state of repair of the building is considered. This lack of attention to the building’s deterioration has resulted in the owner submitting a current application for demolition to council. This accompanies proposals to redevelop the rest of the site into apartment buildings. UAHS has objected to the proposed demolition and maintains that every effort should be made for its retention and reuse. On the day of the collapse, UAHS visited the building and assessed the building’s condition. It appears that the core of the building is not affected, meaning that the collapse that has taken place should have had little effect on the core structure. This historic building is an irreplaceable asset and should be saved. We recommend that options for its retention and reuse should be fully investigated by both council and building owners. We understand that structural assessments are being undertaken by the council. Given that this is a designated building, any recommendations resulting from these structural assessments should be heritage-led, and fully investigate options for the retention and re-use of this important historic building.